This lovely fairy mural merits some explanation, as it is painted in the room of a little girl who needs 24 hour care, and is looked after by her amazing adopted parents and a team of equally wonderful nurses. Growing up now and no longer a toddler, mum decided her room needed a facelift. The idea behind the mural was to try and create a nurturing, loving and also stimulating atmosphere for Lucy-mae and everyone involved in her life. The central figure is mother nature having a wild hair day, the sunset was based on a photograph I took of nearby Rutland Water, and the faeries are based on Brian Froud and Linda Berqkvist's work, plus some of my own. The woodland backround was purposefully painted a little dark to highlight the colourful glowing faeries, and is quite realistic, plus the theme was continued behind those areas were furniture will go, for example in this first picture, a chest of drawers lives in the space bottom left. The tall double swing doors lead to the bathroom and are protected with a couple of coats of tough varnish from bumps and knocks. The room has a calm serenity about it and has taken on a new life of its own. so instead we decided to paint a string of faeries along the top, as though they are standing on it. 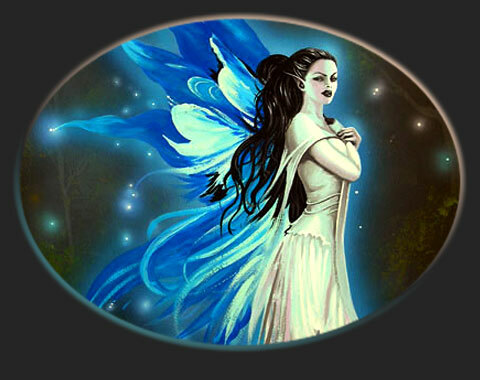 The central character is the essence, or spirit of Lucy-mae, and she is surrounded by her faerie friends and protectors.